A BILLBOARD and poster campaign highlighting political failings in the peace process is being rolled out across Northern Ireland by The Detail. 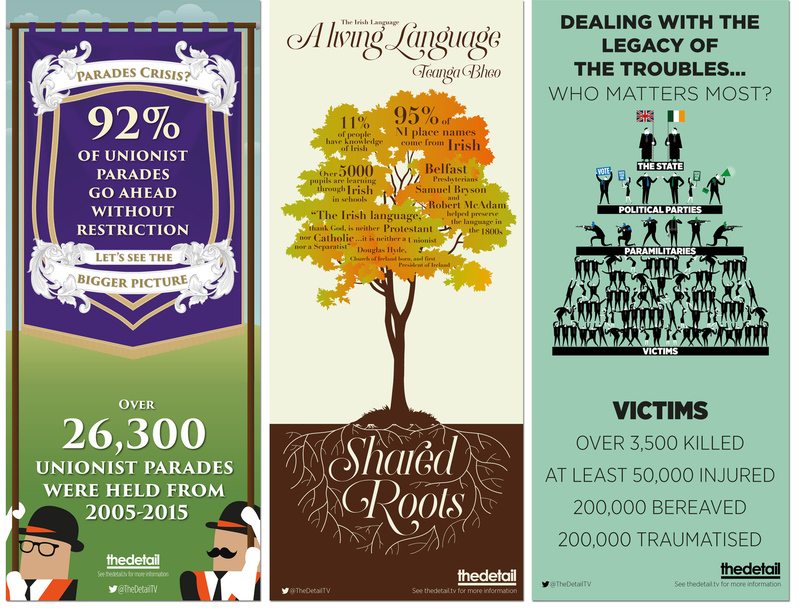 The `Imaging NI’ project aims to spark debate on the issues of diversity, cultural identity and the legacy of the Troubles, using infographics that will appear on posters in every major town and city. This comes as the power-sharing Assembly is again in crisis, but the project focuses on problems in the political process that are not being addressed by the Stormont parties or the British and Irish governments. The project is the latest stage of a multi-media journalism initiative that began when The Detail released a suite of infographics ahead of the recent general election. The new posters on billboards and telephone boxes tackle a series of major issues. They illustrate research that questions the basis for disputes over British and Irish culture. 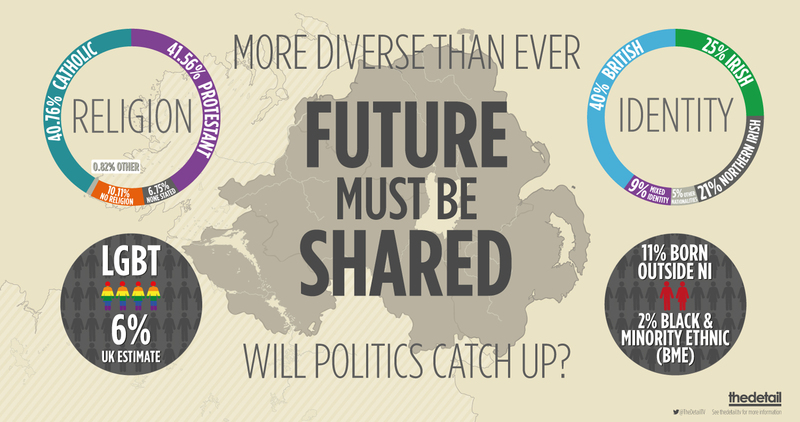 The project also draws on government data to show that Northern Ireland is more diverse than ever, but while society has changed, politics at Stormont has failed to keep pace. Since the current power-sharing government was formed in 2007 it has failed to deliver a wide range of measures. The backlog includes policies to recognise diversity, to address the needs of ethnic minorities and to protect the rights of the gay community. In June the High Court in Belfast also ruled that the Stormont executive failed to meet a legal obligation to produce an anti-poverty strategy based on objective need. A number of campaign groups have called for these issues to be given a greater profile on the political agenda, as previously reported here. The posters produced by The Detail challenge these policy delays and also question repetitive political rows over parading and the Irish language. Despite the negative headlines around parading and the political claims that the tradition is under threat, the figures suggest the marching tradition is very strong. The Detail previously researched data on parades across Northern Ireland that took place from 2004-14, finding that 93% of the thousands of marches organised by the broad unionist community in that period went ahead without restriction. Updated figures covering the period 2005-15, when a large number of parades were organised at the parades flashpoint at Ardoyne in north Belfast, show a similar pattern, with 92% of marches by the unionist community across Northern Ireland going ahead without restriction. The latest data reinforced the positive picture for parading and showed that from 2005-15 the unionist community held more than 26,300 parades. See parades graphic in full here. The billboard project has also examined the cross-community history of the Irish language, noting its shared roots. See Irish language graphic in full here. Despite these findings, politicians have yet to agree new legislation on the future oversight of parading or on the status of the Irish language. There are also delays in delivering two major policy vehicles - a Racial Equality Strategy and a Sexual Orientation Strategy - which relate to the interests of ethnic minorities and the gay community. Other government programmes have become caught up in the logjam at Stormont, though the public concern over the performance of the Assembly is not on the agenda at the current crisis negotiations being held to stablilise the wider political process. The poster project also highlights the legacy of the Troubles and the failure to prioritise victims. See legacy graphic in full here. Legacy issues are included in the talks, but major hurdles exist in dealing with the fallout from decades of violence and building a new future. In 1921 the Northern Ireland population was 66% Protestant and 34% Catholic, but the latest census shows it is now 48% Protestant and 45% Catholic. These figures include the religion people were brought up in, regardless of the person’s current status. However, the census data for the religion held by people, regardless of how they were brought up, reveals that 41.56% are Protestant, 40.76% are Catholic, 0.82% are from other religions, 10.11% have no religion, while 6.75% failed to state a religion. This diversity is also reflected in national identity. Census questions offering a choice from a range of national identities showed that 40% saw themselves as British only, 25% as Irish only, 21% as Northern Irish only, while 9% chose a mix of those three identities. A further 5% held a different nationality. In addition, almost 2% of the Northern Ireland population is from the Black and Minority Ethnic (BME) community. Campaigners for the BME community argue the census figure for ethnicity captures those that do not fall into the category ‘white’ on the census form and they suggest the concept of ethnicity should be widened. In terms of people arriving to live in Northern Ireland, 11% of those currently based in Northern Ireland were born outside it. Figures for the size of the gay community add a further element of diversity. The NI Household Survey 2013/14 found 1.6% in Northern Ireland identified themselves as gay, lesbian or bisexual, but this is believed to under-represent the true size of the gay community. The UK government estimated the UK-wide figure is 6%. This series of statistics, when taken together, show that all religious identities and national identities in Northern Ireland are now minorities falling below 50%. Northern Ireland is a ‘community of minorities’, which it is argued creates a picture of inter-reliance, requiring all sides to compromise. All the political parties at Stormont have stated their support for diversity and for the implementation of appropriate policies. But campaign groups have argued that a gap remains between what the data tells us about diversity in Northern Ireland society and what politics delivers. Earlier sections of the Imaging NI project can be read here: Part 1, Part 2, Part 3. The ‘Imaging NI’ project was supported by the Community Relations Council. The poster campaign will run across Community Relations week beginning on September 28.